Lemons are naturally acidic which makes them a great option to clean with for many areas in your home. They can get the job done just as well, if not better, than harsh chemicals. Here is our top 10 ways to use lemon to clean your home, leaving things feeling fresh! 1. Deodorize and sanitize cutting boards and wooden spoons - Halve a lemon and rub all over cutting board and wooden utensils. Rinse with warm water and set aside to dry. Also works as a stain remover on plastic cutting boards just follow the same steps. 2. Whiten laundry - skip the bleach and dump 1/2 cup of lemon juice into washer with towels and sheets. It will brighten whites and help keep the mildew smell out of towels. 3. Remove hard water stains - use a halved lemon to scrub hard water stains off any fixture. 4. Clean hands - use lemon juice as soap to remove smell of garlic and onion. 5. Scrub grill grates - halve a lemon and sprinkle with coarse salt. Rub on grill grates to remove built up, caked on & baked on food. 6. Replace your Brillo pad - halve a lemon and sprinkle baking soda on top. The citric acid cuts and removes grease. The slight grittiness of the baking soda will do the scrubbing without scratching. 7. 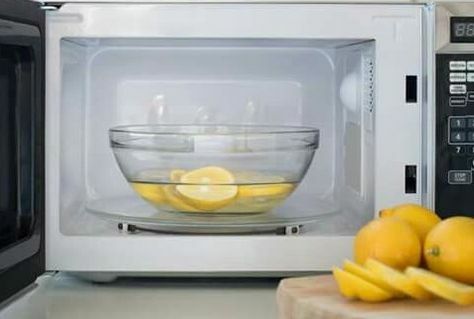 Clean the inside of the microwave - fill microwave safe bowl with 1 cup of water, add 2 tablespoons of lemon juice (or 4-5 lemon slices) and microwave until boiling (about 4 minutes). Leave door shut for an additional 8-10 minutes. Easily wipe down inside of microwave. The lemon will get rid of that funky smell too, bonus! 8. Clean & deodorize the garbage disposal - quarter a lemon and toss it down the disposal. Add 1 cup of ice and turn on. Lemon with deodorize and sanitize and the ice will sharpen the blades. Win, win! 9. Vacuum cleaner - ever notice that weird smell your vacuum leaves behind? Add a couple of drops of lemon juice to the vacuum bag or filter to eliminate the smell and leave your house smelling lemony fresh every time you vacuum. 10. The fridge - halve a lemon and place it in a small bowl. Place in refrigerator uncovered for 24 hours. The lemon will neutralize any odors and leave the fridge smelling fresh. What other ways do you use lemon to clean? We'd love to know.